We released the 0.11.0 exactly 3 months ago. And here we are, 3 months later, still far from the stable release. Our estimate is still the same: just one more month until the stable. It looks like the new wave of people coming to Factorio discovered many new problems. Many of these were in the game from the very early stage, but just haven't been detected until now. All the code written until 0.11 (2 and half years of work) needs to work in strictly deterministic manner now for the multiplayer. 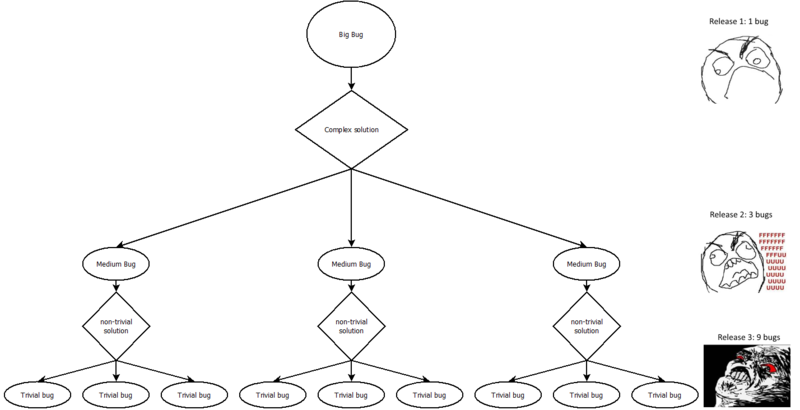 We started to cover all of the bugged areas by automated tests. Sometimes it takes 5 minutes to fix the bug, but another 2 hours to make the correct test for it. I hope it will pay off in the future. The long stabilisation period is quite handy for our graphics department as they need the time to plan experiment and prepare for the endgame era of the game from the graphical point of view. Pavel is preparing the contents for the space launch system while Albert is fully focused on the space platform tileset and aesthetics.